Secret deals in dark corners are the bedrock of the Forge Fathers, but you can't hide on a DreadBall pitch. Everyone can see the grim determination and courage of these stubborn players. 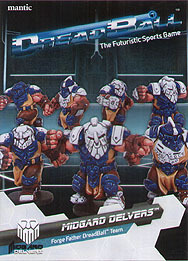 This set contains eight premium plastic Forge Fathers players.